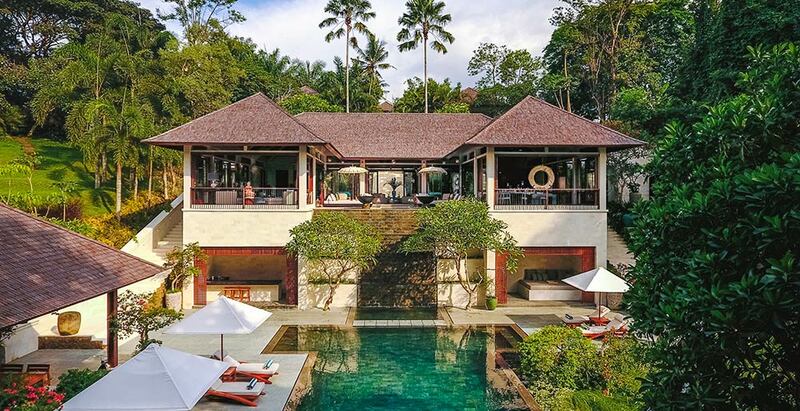 The Arsana Estate is a spectacular multi-pavilion destination villa spread across two-hectares of terraced gardens bordering a river in south-west Bali’s Tabanan Regency, ten minutes from the iconic Tanah Lot sea temple and Bali’s famed surfing beaches. No expense has been spared in creating a truly world-class, fully staffed residence complete with private chef, fabulous living spaces, four bedrooms including a master suite, guest suites and a children’s slumber room with eight beds. Other highlights include a home cinema, games room with pool table and foosball , 19-metre pool with shallow section, gym and yoga facility, hard-surface tennis court and kid’s play area.